Undisputed world cruiserweight champion Oleksandr Usyk will make his heavyweight debut against Carlos Takam on Saturday, 25 May. The Ukrainian, 32, who is the first boxer to hold all four titles at cruiserweight, will fight the French-Cameroonian at the MGM National Harbor in Maryland. "It's a tough first fight," said Usyk. "But I need to test myself against world-class opposition on my new road to undisputed." 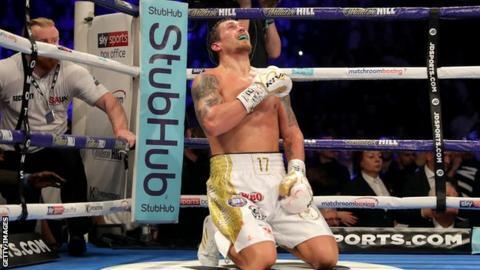 Usyk's final fight in the lighter division came in November when he beat Briton Tony Bellew by a knockout - a seventh straight world title victory. Takam, 38, fought Briton Anthony Joshua for the IBF, WBA and IBO world titles in October 2017, and took him to 10 rounds. He also battled another Briton, Derek Chisora, last July and suffered an eighth-round knockout. He said: "I can promise that this will be a great fight and I will provide Usyk with a huge test on his heavyweight debut. I have huge ambitions of my own in the division and this fight will provide me with the chance to prove that." The fight will be shown on DAZN in the United States which holds the rights to the middleweight unification fight between Saul "Canelo" Alvarez and Daniel Jacobs, and Joshua's triple-title defence against Jarrell Miller on 1 June.